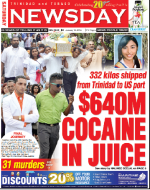 Published on December 4, 2017 in Crime in T&T, Drug Trade, General T&T, Law and Media. 3 Comments Tags: Crime in T&T, Express. Outar Maraj of Mc Bean Village, Couva, appeared in the Tunapuna Second Magistrates’ Court today, on two counts of possession of cocaine for the purpose of trafficking; one count of possession of marijuana for the purpose of trafficking; possession of four firearms and a quantity of assorted ammunition. Published on June 17, 2015 in Complaints, Crime in T&T, Drug Trade, General T&T, Law, Media and UNC. 27 Comments Tags: Crime in T&T, Jack Warner, Kamla Persad-Bissessar, Marijuana, Newsday, Politics, T&T Govt. POLICE confirmed yesterday that they found five grammes of a “plant like material resembling marijua-na” at the Prime Minister’s private residence, prompting Acting Police Commissioner Stephen Williams to order an investigation into the mat-ter. A report of the find was submitted to Williams at 2 pm yesterday — a day after he said that the police were not in possession of any information on drugs being found at the Prime Minister’s residence. The report, signed by Snr Supt Gould and given to Williams yesterday indicated, that the substance contained in a plastic bag was discovered in the male wash-room of a Gazebo on the western end of the Prime Minister’s residence at Phillipine. The discovery was made by a Special Branch officer on Friday April 19, 2013 at about 8.50 am. Published on October 31, 2014 in Drug Trade, Health, International, Law, Media and Politics. 3 Comments Tags: Anand Ramlogan, Attorney General, Cocaine, Crime in T&T, Newsday, Politics, T&T Govt. ATTORNEY General Anand Ramlogan yesterday said he was “gravely disturbed” by the lack of charges in relation to a report of a doctor failing to notify law enforcement authorities about cocaine said to have been surgically removed from the body of a patient. He did so as he called on Acting Police Commissioner Stephen Williams to continue a probe into the matter.